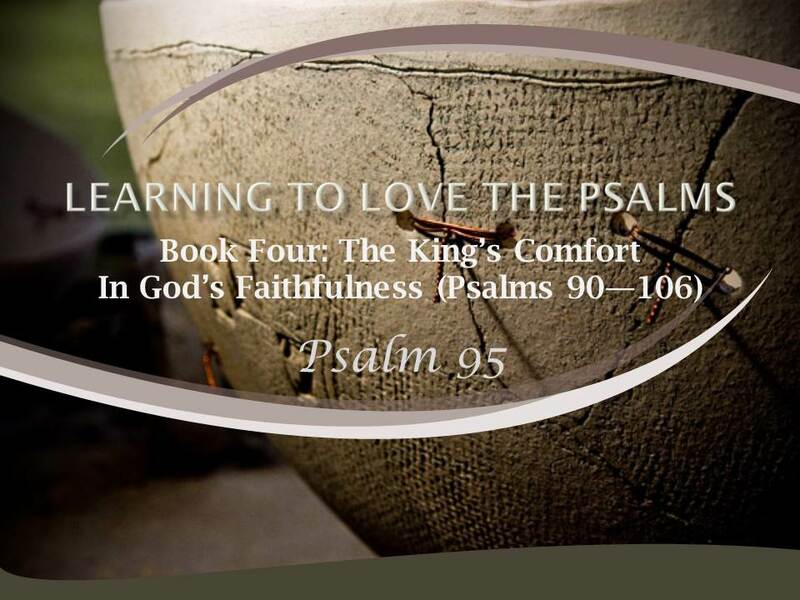 Psalm 95 begins the second section of Book Four, the section that centers on comfort in the worship of God. As Book Four began with psalms that remembered the greatness of God in creation and covenant, so it continues with psalms that call us to worship the God of creation and covenant. The people of God seek comfort in the midst of crises of faith by reminding themselves of God’s character and meeting with God in worship. The beginning of this psalm is a strong and familiar call to worship. This call motivates us to worship by reflecting on the character and work of God for his people. God is “the rock of our salvation,” (v. 1). He is “a great God, and a great King above all gods,” (v. 3). He rules over the gods of this world and uses his power and position to save his people. He is the secure rock on which they can stand and never be shaken. The psalm speaks of God’s rescue of his people from Egypt and his preservation of them thereafter. God is also presented as the Creator God: “In his hand are the depths of the Earth; the heights of the mountains are his also. The sea is his, for he made it, and his hands formed the dry land,” (vv. 4-5). We are called to worship because our God is “the Lord, our Maker,” (v. 6). As he has power over all pretended gods, so he has power over all of nature. This God of such power is also the tender shepherd of his people: “We are the people of his pasture, the sheep of his hand,” (v. 7). There is a close and loving relationship between this great God and the people for whom he cares. He is indeed the rock of our salvation. All of these external acts of worship are meant to express the reality of faith and devotion in the heart. Where the heart is cold and indifferent, the external acts are just hypocrisy and are utterly rejected by God: “This people draw near with their mouth and honor me with their lips, while their hearts are far from me, and their fear of me is a commandment taught by men,” (Isaiah 29:13). Jesus refers to these words in rejecting the hypocritical worship of the Pharisees, (Matthew 15:8-9; Mark 7:6-7). Do these external expressions or worship continue to have a role in the New Testament worship? Paul may give warrant to them: “I bow my knees before the Father,” (Ephesians 3:14), and, “I desire then that in every place the men should pray, lifting holy hands without anger or quarreling,” (1 Timothy 2:8). Many Christians have understood Paul to be speaking metaphorically in these verses, however, concentrating on the internal, not the external. Generally, Christians have believed that such external actions are strictly indifferent, not absolutely required or absolutely forbidden. If they are used, the Bible is clear that they must flow from a sincere heart and not be mere formalism or theatrical self-expression. All acts of worship must support the essence of worship: confessing the greatness of our God with sincere hearts. The call to worship in Psalm 95:1-7 is so strong and so positive that the severe warning of the last verses of the psalm comes as a shock. How can we account for such a drastic change of mood and message? How do these two parts of the psalm relate to each other? At the center of this psalm stands a firm confession of faith: “For he is our God,” (v. 7). The call to worship in the beginning of the psalm and the warning of the last part of the psalm are united by this great truth. If he is our God, we must worship him with great devotion. If he is our God, then we must be faithful in living before him. The warning is precisely necessary against the temptation to allow worship to become an empty form. The psalmist warns the people because “they are a people who go astray in their heart,” (v. 10). The specific focus of the warning is that the people not repeat the sin of Israel in the wilderness at Rephidim. This incident is recorded in Exodus 17. The Israelites were thirsty and demanded water from Moses. Moses replied, “Why do you quarrel with me? Why do you test the Lord?” (Exodus 17:2). God gave the people water when Moses struck the rock. Moses called the place, Massah (which means “testing”) and Meribah (which means “quarreling”). The incident became proverbial for the stubborn and rebellious actions of the people, (see Numbers 20:24; Deuteronomy 33:8; Psalm 81:7). What exactly was the sin of the people in putting God to the test? The answer is clear: “They tested the Lord by saying, ‘Is the Lord among us or not?’” (Exodus 17:7). At the heart of their grumbling and testing was a lack of faith. After all, they had seen the Lord’s power over the gods of Egypt and over Pharaoh, in the plagues and the opening of the Red Sea, in the pillar of cloud by day and the pillar of fire by night – and still they doubted God’s presence and care. Their sin was not praying for water or even wondering where water would come from. Their sin was allowing their need of water to lead them to doubt the presence and love of God. Remembering this episode is particularly appropriate to Book Four. In crises of faith, we may express our confusion and pain fully and plainly to the Lord, but we must not test the Lord. We must not grumble behind his back and doubt in a fundamental way whether the Lord can be trusted. Such doubt is an expression of profound unbelief and stunning ingratitude. Such doubt evoked the anger and punishment of God: “For forty years I loathed that generation. Therefore I swore in my wrath, ‘They shall not enter my rest,’” (Psalm 95:10-11). That generation died in the wilderness and never entered the Promised Land. Those of us in the new covenant who have used Psalm 95 as a call to worship should also use it as a warning to us. This history of Israel is our history. Paul refers to the episode at Rephidim in 1 Corinthians 10:4 to remind Christians that Christ is our spiritual rock from whom the waters of salvation flow. Paul helps us to see the connection between the two parts of Psalm 95, since the God who is the “rock of our salvation,” (v. 1) is the God who gives water from the rock at Massah. He also helps us see that our Christ is our God, our rock, and our water of life. The book of Hebrews makes even more extensive use of Psalm 95. This psalm still warns the church: “Take care, brothers, lest there be in any of you an evil, unbelieving heart, leading you to fall away from the living God. For good news came to us just as to them, but the message they heard did not benefit them, because they were not united by faith with those who listened,” (Hebrews 3:12; 4:2). We must trust God. The New Testament makes clear that Psalm 95 still speaks to us. It reminds us that the Lord is our God. And then it says, “Come and worship your Savior and Creator.” It also specifies to those who hear the call to worship: “Today, if you hear his voice, do not harden your hearts,” (vv. 7b-8a). What makes the beginning of this psalm a strong and familiar call to worship? What are some specific acts of worship the psalmist calls for in Psalm 95? Do these external expressions of worship continue to have a role in New Testament worship? While the call to worship in this psalm is prominent, how do we account for the drastic change of mood and message in the severe warning? How do these two parts of the psalm relate to each other? How does Psalm 95 serve as a warning to us as Christians under the new covenant? In what ways does this psalm remind you that the Lord is your God?